Louise: Yeah, where do you get off behaving like that with women you don't even know? Huh? Huh? How'd you feel if someone did that to your mother? Or your sister? Or your wife? Q: What is 'Thelma & Louise' about? Q: What kind of car were Thelma and Louise driving? This is an important commercial film aimed at blue collar women who feel victimized by both society and the men in their lives. Directed by Ridley Scott, who directed the science fiction classics, Alien (1979) and Blade Runner (1982), Thelma and Louise is an on-the-lam chick flick (with chase scenes), a kind of femme Butch Cassidy and the Sundance Kid (1969), somewhat akin to Wild at Heart (1990) and Natural Born Killers (1994) but without the gratuitous violence of those films. Ridley Scott walks the razor edge between femme-exploitation and serious social commentary. Incidentally, the script is by Callie Khouri who wrote Something to Talk About (1995) and Divine Secrets of the Ya-Ya Sisterhood (2002) which should give you an idea of how men are depicted here. 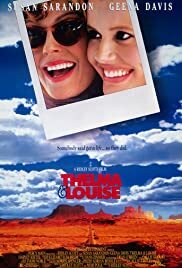 Susan Sarandon is Louise, a thirty-something Arkansas waitress with an attitude and some emotional baggage, and Geena Davis is Thelma, a cloistered ingenue housewife with a yearning to breath free. Both do an outstanding job and carry the film from beginning to end. The characters they play are well-rounded and fully developed and sympathetic, in contrast to the men in the film who are for the most part merely clichés, or in the case of Darryl (Christopher McDonald), Thelma's boorish husband, or the troll-like truck driver, burlesques. I have never seen Geena Davis better. Her unique style is melded very well into a naive woman who never had a chance to express herself, but goes hog wild and seems a natural at it when the time comes. Sarandon is also at the top of her game and plays the crusty, worldly wise, vulnerable Louise with tenderness and understanding. Note, by the way, her pinned up in back hair-style, directly lifted from TV's Polly Holliday ("Kiss my grits!") who appeared as a waitress in the seventies sitcoms "Alice" and "Flo." Harvey Keitel plays the almost sympathetic cop, Hal Slocumb, and Brad Pitt appears as J. D., a sweet-talking twenty-something who gives Thelma the script for robbing 7-11s as he steals more than her libido. This movie works because it is funny and sad by turns and expresses the yearning we all have to be free of the restraints of society and its institutions (symbolized in the wide-open spaces of the American Southwest) while representing the on again, off again incompatibility of the male and female heart. The male-bashing is done with a touch of humor and the targets are richly deserving of what they get. The ending is perhaps too theatrical and frankly unrealistic, but opinions may differ. Best and most telling quick scene is when Thelma phones Darryl to see if he has found out about their escapades. Weasel-like, he is trying to help the cops locate them, but he is so transparent to her that all she has to do is hear his voice. "He knows," she says to Louise and hangs up. Best visual is when the black police helicopter appears suddenly, menacingly like a giant fly beneath the horizon of the Grand Canyon. Also excellent were the all those squad cars lined up like armored battalions aimed at the girls on the run. I also liked the scenes at the motel with J.D. and Louise's boyfriend. They were beautifully directed and cut, and very well conveyed by Sarandon and Davis, depicting two contrasting stages in male-female relationships. See this for Geena Davis because she was brilliant, vividly alive and never looked better. 110 of 166 people found this review helpful. Was this review helpful to you?